Beef cattle numbers peak at about 900 head, consisting of spring and fall breeding herds of 350 cows and approximately 300 stockers grazed each year at the Brown Loam Branch Experiment Station. Photo by David Ammon. The personality of livestock may seem secondary to productiveness, but research shows that the two may be connected. Cow temperament is correlated with how much money the cow brings in and how frequently it gets sick. Poor-tempered cattle are also known to produce less marbling and tougher beef. In an on-going study at the Brown Loam Research Station, researchers have studied the link between a cow’s temperament and performance. 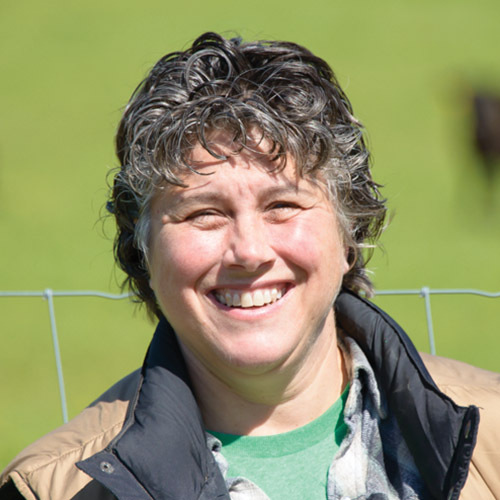 Dr. Rhonda Vann, research professor in the Department of Animal and Dairy Sciences and the Experiment Station, pioneered work on this front. “For the past decade we’ve been trying to determine whether cattle temperament is related to growth performance and immune function, and if temperament is inherited by offspring,” Vann said. Her research has found that a poor temperament has a myriad of negative effects on performance. To assess temperament, scientists conduct two tests. First, the cow is put into a pen and approached by the researcher. Calm animals move slowly and can be approached. In contrast, aggressive, or temperamental, animals may run into fences or even attempt to trample humans in the pen. Based on this interaction the cow is awarded a pen score of one through five, one being calmest, and five being most temperamental. Next, they are scored on their flightiness. Each animal is herded into a chute and timed as they leave it over a fixed distance of six feet. The resulting time is their exit velocity. Finally, both scores are averaged to determine the overall temperament of the animal. While temperamental cattle are problematic, cows can be too calm. Cows with overly docile temperaments are also prone to disease, and they may not defend their calves against predators. “Very docile animals don’t fight to get through diseases. They’re down on the ground with the first symptoms, and require more veterinary care. Temperamental cows, on the other hand, won’t show any symptoms until they’re too sick to treat. You want that in-between—cows that show illness early enough to be treated, but have enough fight to survive,” explained Vann. Because temperament can be inherited, researchers hope to be able to breed cattle that have that happy medium of temperament, which in the long run will require less veterinary care. This is particularly important due to changes in regulations and consumer demand regarding the use of antibiotics to treat cattle. “As regulations and consumer demand change, it’s extremely important to choose cattle that are naturally healthy and have better immune function,” Vann said. While healthy animals are vital for successful production, a calm temperament also impacts the meat that ends up on your dinner plate. 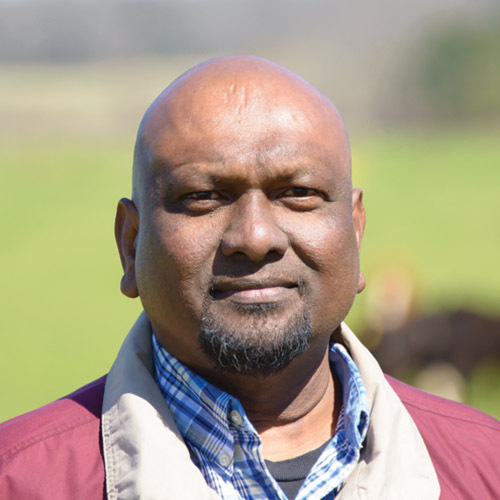 Dr. Bisoondat Macoon, associate research professor in the Department of Plant and Soil Sciences and Experiment Station scientist, conducted the first temperament-related grazing study in the United States. His study examined the correlation between grazing behavior and weight gain—a factor which may impact meat quality. “Calm cattle spend more time eating and less time acting vigilant. A temperamental cow, on the other hand, is going to be aware of every possible threat. It will expend more energy, which leads to less weight gain,” Macoon explained. A fat cow means better prices at market, which is important for producers trying to make a living. The old adage, ‘one bad apple spoils the bunch’ may be true with cattle also. Studies at Brown Loam have shown that pairing an excitable calf with a calm calf during grazing makes the calm calf more excitable. The project has also proved that temperament is inherited; in a study conducted with Brahman influenced calves, researchers found that temperament can be passed down to offspring. They determined that their method of assessing temperament using pen scores and exit velocities was correlated with the amount of the stress hormone, cortisol, circulating in the cow’s blood, and that each calf was likely to have inherited a temperament similar to its parents. Using this knowledge, producers will be able to select for lineages of cattle that are healthier and easier to work with. In the hopes of finding a less invasive way to measure cortisol levels, Vann recently did a study assessing whether or not cortisol could be measured through hair samples. Unfortunately, the hormone didn’t appear in the animal’s coat until long after the stressful event had occurred, and then only in a very small amount. At present, the best way to measure temperament continues to be blood samples and observation-based pen scores. 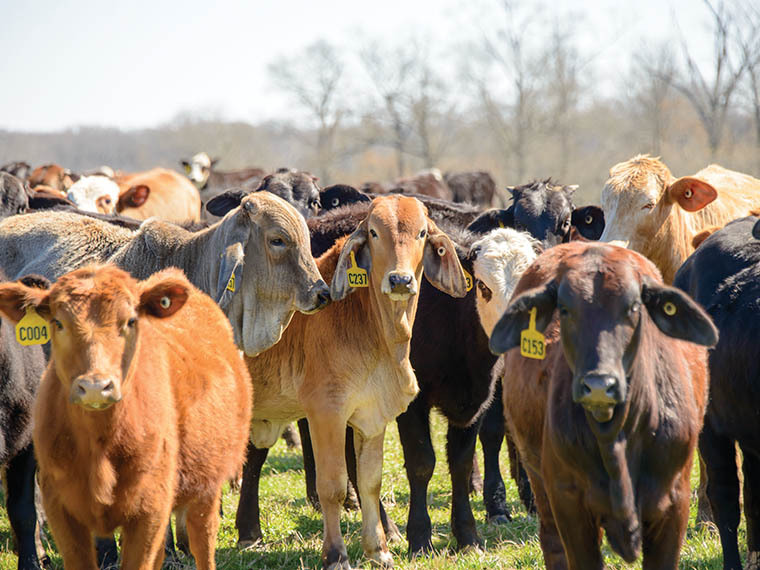 Beef cattle producers can impact their overall profitability by assessing the temperament of their cattle and culling those animals that are temperamental. The research conducted at Brown Loam Research Station is one of many studies conducted throughout the Mississippi Agricultural and Forestry Experiment Station that helps supply the world with safe, humane, and nutritious food. Funding for these projects was provided in part by the Experiment Station and the U.S. Department of Agriculture. Focus: Growth physiology, cattle temperament, and reproductive physiology in beef cattle. Passion At Work: I love the baby calves and want to do all that I can to assure that they have a wonderful healthy life for producing the best beef products in the world and also producing future offspring. Focus: Grassland ecology, management, and utilization, including use of grassland plants for bioenergy applications and ecosystem services. Passion At Work: I find it incredibly exciting when discovering and then explaining how management of plant-animal-soil interactions can be manipulated to improve animal agriculture production while ensuring environmental stewardship.